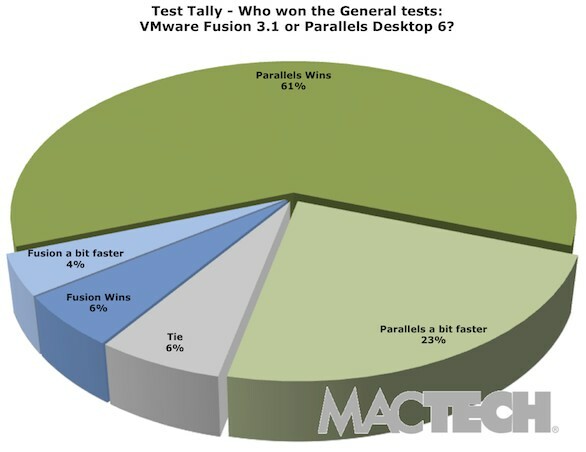 If you were wondering whether to get Parallels 6 or VMware for virtualization, then some recent tests by MacTech may have the answer for you. In a series of benchmarks pitting the new Parallels 6 vs VMware Fusion 3.1, Parallels is the hands-down winner. In 84% of the tests performed, Parallels 6 beat the competition in everything from general performance benchmarks to I/O, CPU footprint, Office performance, and 3D graphics and 3D games. 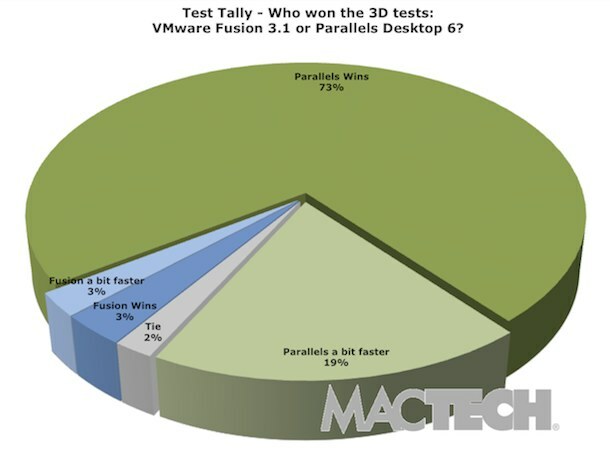 The scores in 3D graphics and games are even more in Parallels 6 favor, with Parallels beating VMware in 92% of the tests run. This doesn’t surprise me considering the amazing Parallels 6 gaming performance we saw earlier in the year. If you’re shopping, you can buy Parallels Desktop 6 for Mac for $64.99 through Amazon , a 20% discount on the retail price. You can also read more about the benchmarking of the two apps at the preview on MacTech, but more comprehensive benchmarks are expected in the near future. There is one area where the VMware does infact trump Parallels, and that in portability to the enterprise. Creating a VMware machine on your Mac, and then porting up to your ESX(i) server is a snap. From Laptop to Server in minutes.. It is silly to think that Parallels is a superior alternative to VMware Fusion no matter where the product (Parallels) supposedly excels. The so-called benchmark considers (or at least reports) only the number of tests where Parallels “outperforms” VMware Fusion, not by how *much* it does so. Call me suspicious. Exactly- most people don’t know what ESXi is. Parallels may have a performance “advantage” but at the cost of stability. I’ve used Parallels, VirtualBox and Fusion- Fusion is more stable as well as being more compatible. Too many ‘little things’ creep up with Parallels that compromise reliability. For me- Fusion… just works. Wmware is much faster on my 2011 MBP pro 2.2 i7. Try both before you buy! VMWare ismuch faster on my MacbookPro 2.8 i7 and also supports the ability to take my VM from a client company (windows only enterprise) and run on my Mac. With parallels I would need to have a machine to be able to convert it.